Landgren, J (2015). Organisatorisk förstärkning. In Att åstadkomma inriktning och samordning: 7 analyser av branden i Västmanland 2014. Ed Christian Uhr, Lund. Landgren, J., & Bergstrand, F. (2016). Work Practice in Situation Rooms–An Ethnographic Study of Emergency Response Work in Governmental Organizations. In International Conference on Information Systems for Crisis Response and Management in Mediterranean Countries(pp. 157-171). Springer International Publishing. Bergstrand, F., Landgren, J., & Nuldén, U. (2016). Communicating Location and Geography in Emergency Response. 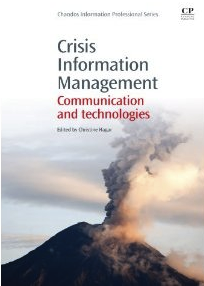 International Journal of Information Systems for Crisis Response and Management (IJISCRAM), 8(1), 47-64. Landgren, J. (2015) Insights from an ethnographic study of a foreign response team during the EBOLA Outbreak in Liberia. In Proc ISCRAM 2015, Norway. Bergstrand, F., & Landgren, J. (2013). Authorities Don’t Tweet, Employees Do!. In Workshop on Informing Future Design via Large-Scale Research Methods and Big Data. MobileHCI 2013. Kunz, A., Yantaç, A. E., Alavi, A., Woźniak, P., Landgren, J., Sárosi, Z., & Fjeld, M. (2013, June). Tangible tabletops for emergency response: an exploratory study. In Proceedings of the International Conference on Multimedia, Interaction, Design and Innovation (p. 10). ACM. Sjöberg, E., Barker, G. C., Landgren, J., Griberg, I., Skiby, J. E., Tubbin, A., & Knutsson, R. (2013). Social Media and Its Dual Use in Biopreparedness: Communication and Visualization Tools in an Animal Bioterrorism Incident.Biosecurity and bioterrorism: biodefense strategy, practice, and science,11(S1), S264-S275. Bergstrand, F & Landgren, J (2011) Visual reporting in time-critical work: Exploring video use in emergency response. In proc of MobileHCI, ACM, Stockholm Sept 2011. Bergstrand, F., Landgren, J. (2009) Using live video for information sharing in emergency response work. International Journal of Emergency Management. vol 6(3/4). Indersciences Enterprises Ltd.
Bergstrand, F., Landgren, J (2009) Information Sharing Using Live Video. In proc. ISCRAM2009, Gothenburg, Sweden. Landgren, J (2008) Critical lessons learned: Evaluation of commercial mobile incident support systems. Mobile Response 2008, Fraunhofer. Landgren, J (2007). 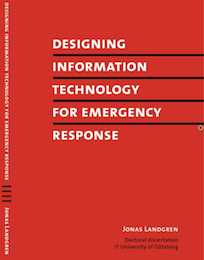 Investigating the tension between information technology use and emergency response work. In Proceedings of the European Conference on Information Systems (ECIS2007). St Gallen, Switzerland. Landgren, J (2006). Evaluating the benefits of information technology use in time-critical work. IRIS29, Helsingor, Denmark. Landgren, J (2005). Using digital traces of action to support time-critical work. IRIS 28, Kristiansand, Norway. Landgren, J & Nulden, U (2004). A Framework to plan and Review field studies. In Proceedings of IRIS28, Falkenberg, Sweden. Landgren, J (2004). Fire Crews at Work, Short paper presented at Participatory Design Conference 2004, Toronto, Canada. Landgren, J (2004). Fire Crew enroute Sensemaking, In proceedings of International Workshop on Information systems for Crisis response and management, Brussels, Belgium. Landgren, J (2003). Tooltime. In Proceedings of IRIS27, Helsinki, Finland. Landgren, J (2008) Översvämningen Gårda 2008, – rekonstruktion av insatsarbetet och efterföljande återuppbyggnadsarbete. Räddningstjänsten Stor-Göteborg. Landgren, J (2006) contribution to bookchapter ”Användarmedverkan vid utformning av IT-stöd för ledning” in Kolega, Samuels chapter 9 ”Command Support”, in the edited book ”Management of rescue operations in the complex society. Eds Fredholm, Lars., Göransson, Anna-Lena. Räddningsverket.